Read as much or as little as you want. 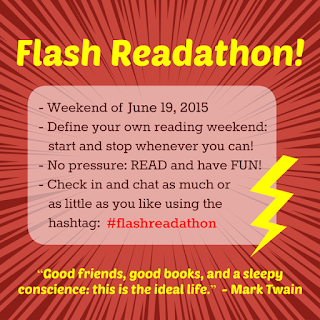 Jump in, be a part, get some reading done, and hashtag #flashreadathon if you want some company. So glad Shaina made the call to arms and that Monika updated the graphic. I'll be finishing up The Shore. I still have a long way to go, but this week just hasn't afforded me as much time to read as I wanted. 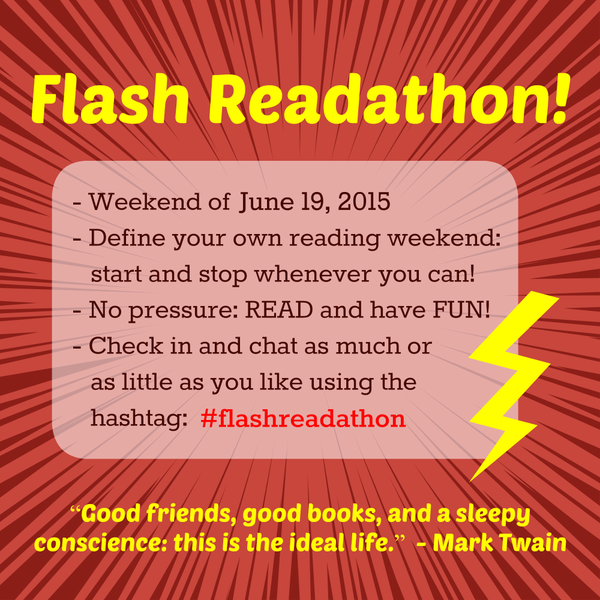 That's why this #flashreadathon is so perfect for this weekend. Another event I cannot join. Bah!! I will be backstage for The Sound of Music. Fun, yes, but another reading event I have to pass on. Sunny skies all weekend. Maybe I'll dig out the hammock and find a shady spot in the backyard. Ooh. I'll mostly be hiking this weekend but plan on bringing my book with me (a Beat anthology) so hopefully I can get some reading in while hunkered down by a lake in the mountains of Montana. Sounds good to me! I'm joining in to, but with a homeschooling book. Happy reading! Yay, flash readathon! I started yesterday and burned through The Beautiful Bureaucrat. Happy reading!